You are here: Home / Uncategorized / Croatia 2032: Ghost Towns and Tumbleweeds? Croatia 2032: Ghost Towns and Tumbleweeds? The topic of demographics and the alarming rates of people, particularly the young, leaving Croatia in search of work and prosperity is, and has been for a few years now, on every government or opposition politician’s lips, and the country’s president’s. But absolutely no national remedial strategies issued, absolutely nothing seems to have changed, except the political party or the government at which the blame-finger is pointed at any one particular time. The numbers of those leaving Croatia keep rising. 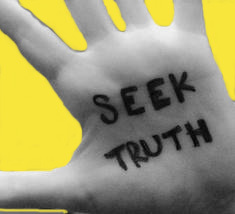 Young people in particular appear to be resigned to the fact that there are no jobs or employment opportunities for them and this leads to personal frustration, resentment, despair … one loves ones country and yet survival in it is harsh and in many instances impossible if dignity is part of that survival. And – corrupt nepotism hasn’t moved down and out a single notch! And the Diaspora wants to contribute, it wants to help – but, hey – this notion doesn’t seem to have truly sunk into the Croatian governing echelons despite what looks more and more like a smokescreen of incessant lukewarm invitations to the diaspora to come and come and come. 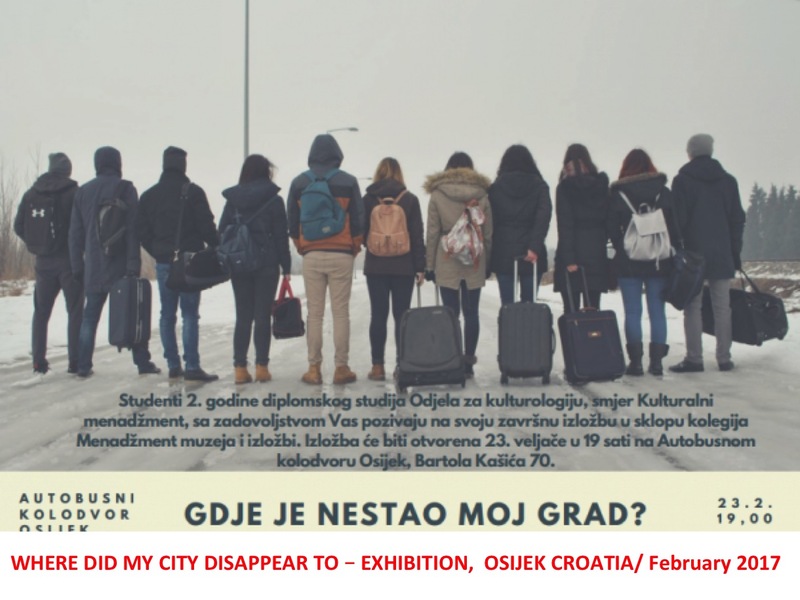 During the past week in the Croatian city of Osijek, which lost so very much blood and so very many lives in defending itself from Serb aggression in the early 1990’s – brought, through a University students’ exhibition, to painful attention the wound that destruction and unemployment open and leave oozing into a bleak and alarming picture of the not so distant future. “The vision of empty streets of Osijek in photos almost freezes the blood in our veins. There are no movements on city squares in them, business premises – locked. ‘Lively’ though, is the map of the world. Strewn across it are the portraits of those that are born, that grew up there, even graduated from the university in Osijek and who then packed their suitcases and left ‘in search of bread’ abroad. It’s 2032, and the last of the inhabitants are leaving Osijek. This apocalyptic forecast is the theme of the exhibition called ‘Where did my city disappear to’ authored by 11 students of Cultural Management studies at Osijek University. Their final exam is actually in Museum and Exhibition Management. Everything occurs under the mentoring by Prof. Andjelko Mrkonjić and his assistant Tomislav Levak. Symbolically the exhibition is held in the Bus terminal in Osijek, Croatia. – We refer to the imagined year 2032, when, as we presume, the city will be empty. How realistic is that? Given the current situation – it’s very realistic. If the young people continue leaving intensively in such high numbers, it’s questionable who will remain, said Matea Milinkovic, a student. The public does not know the exact number of those who had already left, even the authorities don’t know that number – neither the state or the local authorities. However, it is understood that some 22,000 people have left Slavonia and Baranje in the past six months. As soon as it was announced the exhibition has ‘stirred some spirits’. Both the professors and the students were aware that the exhibition would lead to reactions but they emphasise that their primary goal is to warn of what may be coming. After all, they themselves do not want to become a part of the statistics representing those that have left. The students organising this exhibition do not want to spread a message of pessimism but want the exhibition to reflect their wish and their belief that the situation can be changed. They don’t want to be in a position of an immigrant and become ordinary foreigners in other people’s countries. Osijek is their city and they don’t want to leave it, and by remaining there, with their efforts and work they wish to stop the realisation of the sad destiny for the city predicted in this exhibition and by many leading minds of Croatia. I will be in Dubrovnik in a month. I need to go to Eastern Europe more. It is where my family came from and it is so beautiful. I wonder if sorrow amplifies beauty. Because Croatia is so beautiful. Croatian politicians have failed miserably and it is time for some serious changes to happen before its too late. Yeah, that’s because the Cro government don’t give a f..k about the Croatian people. It’s like everywhere else in the world, governments work for the bankers, and people are just assets they can borrow more money on for em selves!!! Who will shine a light here for Croatia? I pray, I hope, I wait – I will join in. it would be better if half the politicians in Sabor left! They are useless! All the young people in Croatia should publicly demonstrate in front of Sabor….every day and put the pressure on big time!! From Facebook comments: My two young nieces have left Croatia last year, to Ireland. No job here. Of course, they have a university degree. My nephew, 31, has also left Zagreb, to work on Kosovo, then in Macedonia. My cousin, younger then my son, has left Croatia 4 years ago. He could not find a job here. My daughter is on the Bureau for Unemployed People. What to say? Yes, it’s absolutely economic with jobs a top priority, but it’s also demographic. Croatia, like many european countries have stopped reproducing themselves. For variety of reasons the value of marriage, children and family has weakened. Less people get married, more people wait to later years for marriage often opting for one or no children. Not a recipe for future success. In pure economic terms without children there is no future market. No future market, no future economic opportunities. It’s a death spiral. 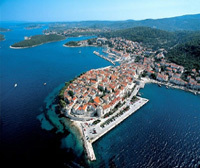 Small countries like Croatia are particularly vulnerable (economies of scale work a state level). But Croatia has all the right ingredients for an economic and demographic boom – we’re part of a much larger EU market, we have very talented people, we have a diaspora that is highly motivated, educated, experienced and entrepreneurial. We just lack a ‘top-chef’ to mix and stir the ingredients. But we have to wake up first from our communist zombie like state of being. Waking up is the key, Sunman – so right! The ruling class in Zagreb seems hellbent on forcing out the young and refusing entry to the diaspora. Why? Perhaps then they can sell off Croatia’s empty cities and towns to foreigners? Thank you – Zeljko – for this, indeed pressure is being implemented and letters of what I know but perhaps it needs to be more. So yes, great suggestion and thank you for the trust in diaspora. In my two visits to Dubrovnik and along the Dalmatian coast, it was sad to see abandoned homes and buildings along the countryside. For the all natural beauty of the area, seeing the war time scars is something you don’t forget. Zeljko, its time for Croatian’s to take their destiny in their own hands. There is little time left. Some people say it will take generations. if it does Croatia will not exist. This exhibition is proof. Diaspora can only do so much and can be accused of interfering while living abroad, as the communists always say. They seem to know everything about capitalism and democracy and we know nothing, even though we have spent all our lives in a western system, after all, they are “Doctors”. You know who these old communists and young communists are, we do not. How do you eat a elephant? One bite at a time. Priority, all judges should be replaced and the court system needs to be reformed. I would request assistance from the German government in this area. If this money (taxes) is used properly , many industries could be expanded to enhance the skills of our very bright youth . But how can they be encouraged when massive debts are going to destructive sectors . Everyone knows that Hrvatska is one of the more beautiful nations in Europe . With a small population much could be done for the better , starting by not letting the octopus of globalism directing and invading its future . The internationalists want to take our peoples Christian sovereignity culture and faith . That’s the main reason for poor economy . Things were better before EU membership , in spite of having to recover from the devastation of war . My Croatian grandma’s naturalization papers state that she was born in 1897 in Consekiewa, Yugoslavia. I cannot find that town on a map and Google doesn’t turn up anything either. Any ideas? Grandpa was from Krizevac. I can find mountains in BH by that name, but no village. It is hard to say if I have the correct spellings or not. Both my grandparents were illiterate and the immigration people may have taken liberties with spellings, especially since we don’t have letters with accent marks in the U.S. So, they just changed it. They both identified as Croatian. My grandpa’s name was Staba, with an accent over the “s.” I met some of his relatives in 1980 who lived in Zagreb. We lost touch after the war. I stumbled upon a cemetery near Plitvitce Lakes in 2014, with many tombstones with my grandma’s maiden name, Cindric. Some relatives spell it Cindrich. Thank you for the other spelling suggestion for her hometown. My husband and I visited Sarajevo in 2014 and were impressed with the determination and positive nature of the young people we met there. They want to move forward with their lives yet find some reconciliation with the unspeakable past. The war museum was heartbreaking. Good luck with your work for justice. I think that Serbs are at fault for the emptying of the cities. We are clearly suffering ptsd from the aggression of the 90s and we are afraid it will happen again. I think the purchase of fighter jets was smart. We can go to war with the serbs again because croatia is controlled by communists to this day. Only then will cities like osijek thrive. This will create many jobs for the many students that reside in osijek. Hang on, didn’t you Croats get your independence in 1995? That’s 23 years ago and you still blame the Serbs in 2018? It’s no wonder Croatia is screwed with that mentality – symptoms of OCD, not PTSD. Especially when you think that declaring war on Serbia is a great idea to improve Croatia’s economy – WTF? You Croatians left Yugoslavia and amazingly gave up your political and economic independence again to the supranational European Union (Yugoslavia-on-steroids) in 2013. So you exchanged being a big fish in a small pond, for being a little fish in a big pond – genius! Hence your economic problems and the exodus of your population. Here is some advice. Firstly stop being obsessed by the Serbs – it’s called “responsibility deficit disorder”, and considered by medical people to be a mental condition. Secondly leave the EU and regain your independence before it’s too late. Your response to my reasoned argument that an independent Croatia cannot move forward if it keeps looking back and blaming somebody else for its problems is a classic fallacious argumentative strategy whereby genuine discussion of the topic (demographics & economics) is avoided by attacking the character of the person making the argument, or persons associated with the argument, rather than attacking the substance of the argument itself. You have been an independent sovereign state for 23 years – it’s down to the Croatian politicians/leadership to build a prosperous country for the benefit of all Croatians. If they have failed it has nothing to do with anyone outside of Croatia.